Homemade cream of broccoli soup is a family favorite! 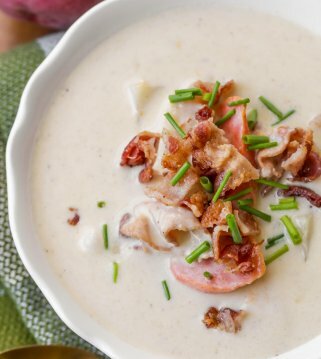 Velvety soup that is healthy, rich and simple and filled with flavor and topped with bacon and cheese. After a busy day, the last thing I want to do is think about what’s for dinner. 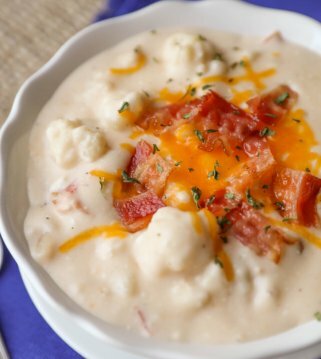 I try to meal plan to make things easier, but sometimes even then, I just want to do something simple like soup. 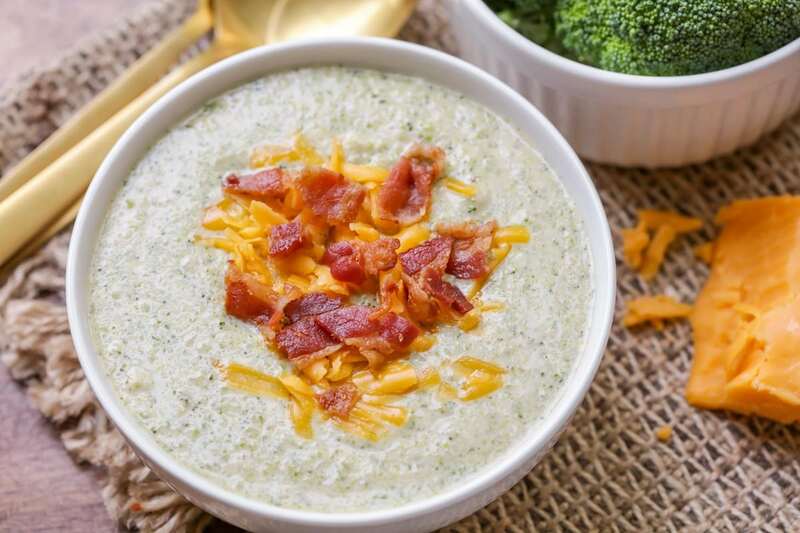 We have been long-time fans of Broccoli Cheese Soup and have been wanting to try a cream of broccoli cheese soup. This broccoli soup is loaded with healthy green broccoli but also has a creamy texture that your family will devour. Did I mention it can be made in under 30 minutes? That’s my kind of recipe. This soup is delicious just in a bowl and eaten on it’s own, but you could take it to the next level but serving it in bread bowls. 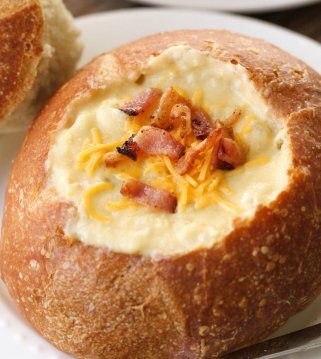 Are bread bowls the best invention ever? I think so. 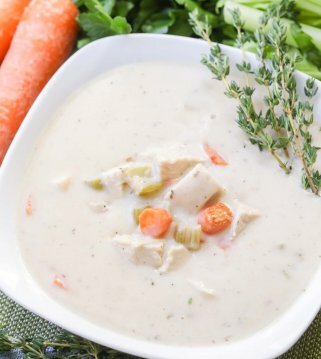 I promise this soup will be on rotation all fall/winter long! Pureeing broccoli for soup is easier than it looks. Begin by sautéing the garlic and celery in butter on a stovetop until tender. Add 8 cups of broccoli florets and the broth. Cover this mixture and let simmer for 15 minutes. 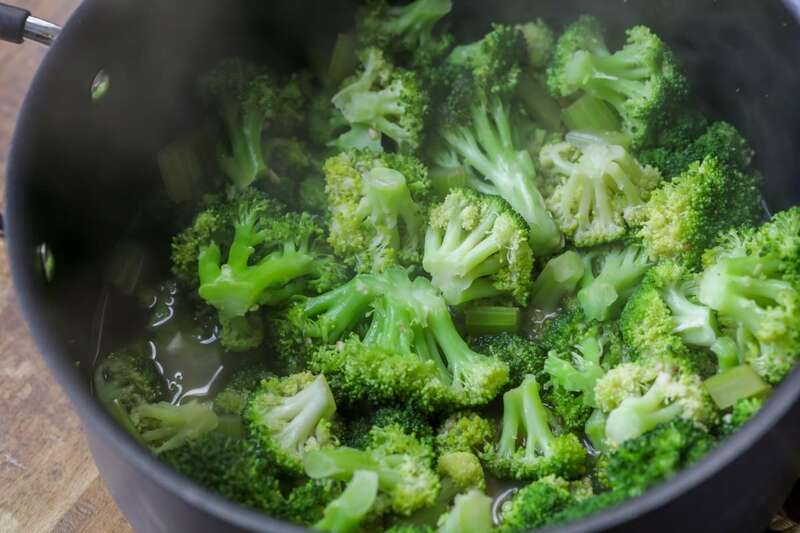 While the broccoli is simmering, melt 3 tablespoons of butter on low heat in a small saucepan. Stir in the flour, add the milk, and stir until thick and bubbly. 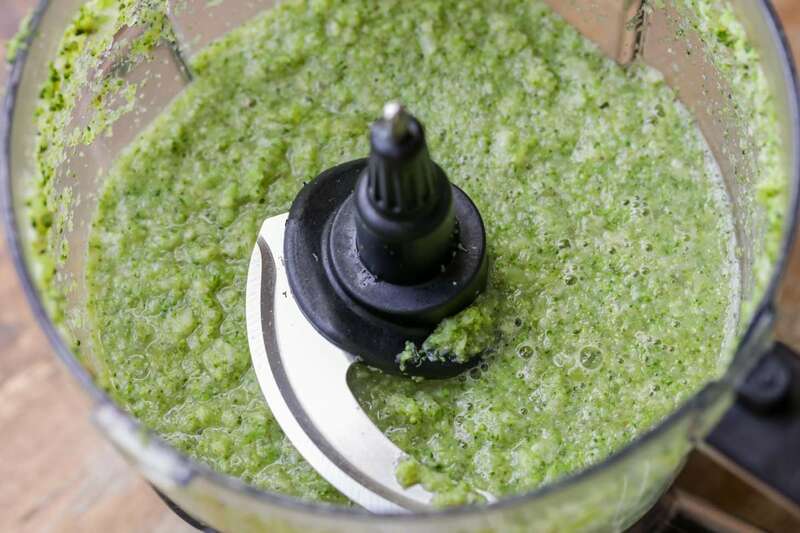 Take the broccoli/broth mixture and pour into a blender in batches. Pulse for a few seconds and then blend until smooth. You can use any kind of blender, a food processor, or an immersion blender. 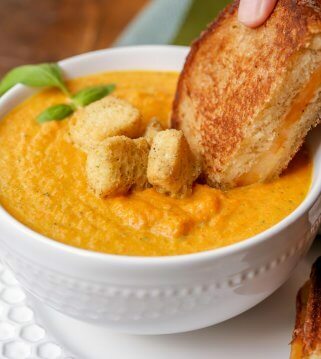 Any of those will work perfectly for blending this soup to perfection. Once you have blended the soup, combine it with the flour mixture. Season with garlic salt and pepper. Then stir in some grated cheddar cheese (yum!!). Can you use frozen broccoli? Yes, you can. 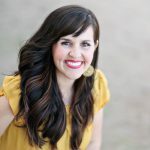 We recommend fresh broccoli, but you will most likely need another cup of chicken broth AND a longer time to cook the frozen broccoli before pureeing. 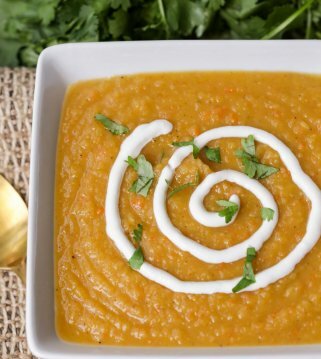 Pour this delicious soup into bowls (or bread bowls!) and enjoy! 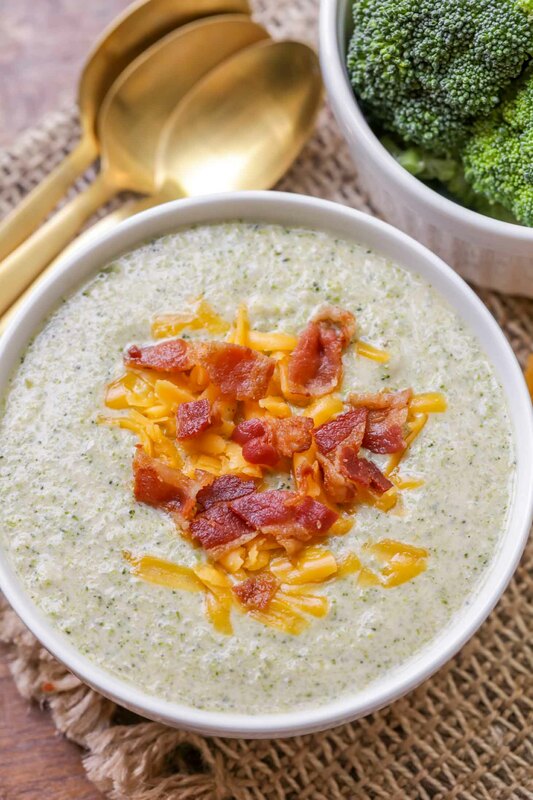 It’s a great way to enjoy the flavors of broccoli cheese soup in a more creamy way! In a medium stock pot, melt 2 tablespoons butter and saute garlic and celery until tender. Add broccoli and broth, cover and simmer for 15 minutes. Meanwhile, in a small saucepan, over low heat, melt 3 tablespoons butter, stir in flour and add milk. Stir until thick and bubbly. In batches, pour the soup into a blender and pulse for a few seconds, then puree until smooth. Add soup to flour mixture. Season with garlic salt and pepper and stir in cheddar cheese. If desired, garnish with more cheese and bacon.